Epigenetics, which scientists define as heritable changes in gene expression that do not involve alterations in the DNA sequence, is drawing the increasing attention of investigators all around the globe. In addition to its role in helping researchers better understand organismal development, epigenetics has emerged as an important facet of disease pathogenesis. The creation of new experimental strategies represents a fundamental component of the efforts to gain deeper insights into the epigenetic modulation of gene expression. For example, at Keystone Symposia’s “Epigenomics” conference last month, Peter A. Jones, Ph.D., distinguished professor of urology and biochemistry at the University of Southern California, talked about a new method that investigators in his lab developed to simultaneously map the presence of nucleosomes and DNA methylation on individual DNA molecules. “The idea is that we place a chemical marker on the DNA molecule, which allows us to determine which DNA areas are open and which ones are wrapped around nucleosomes, and we can relate this to DNA methylation,” explained Dr. Jones. For the past 30 years, nucleosomes were mapped by limited digestion with DNA-cleaving enzymes such as DNAse I or micrococcal nuclease, and the location of DNA methylation sites was revealed by parallel experiments. The nucleosome occupancy methylome-sequencing, or NOMe-seq, single-molecule high-resolution nucleosome positioning assay that Dr. Jones and colleagues developed is based on the accessibility of the DNA to the M.CviPI GpC methyltransferase that recognizes GpC dinucleotides not associated with nucleosomes or transcription factors. This technique allows the simultaneous visualization, within the same DNA molecule, of the endogenous DNA methylation and nucleosome occupancy distribution, irrespective of the density or methylation status of CpG sites. When used to examine the well-characterized enhancer/promoter pair of the MYOD1 gene in somatic cells, the NOMe-seq method revealed that a nucleosome-depleted region exists at enhancers in opposing transcriptional states, and Dr. Jones and collaborators showed that this architecture may be associated both with active and repressed promoter states. The presence of epigenetic marks correlated with both activation and repression mirrors previous findings from embryonic stem cells, where similar bivalent marks were characterized and are thought to keep genes poised for induction. The presence of permissive enhancers associated with certain promoters that are repressed by the polycomb-repressive complex allows these loci to retain their permissiveness and ensures epigenetic plasticity during reprogramming in somatic cells. Dr. Jones and colleagues previously revealed that DNA methylation acts as a lock to silence transcriptionally inactive chromosomal domains. The scientists showed that three nucleosomes, which in normal cells are almost completely absent from the start sites on MLH1, a gene implicated in colorectal and breast cancer, exist in methylated and in silenced promoters, suggesting that the stable placement of nucleosomes into previously vacant positions could provide a mechanism for epigenetic silencing. “The way this works is that the nucleosome is a substrate for de novo DNA methylation, and in order for genes to become silenced, the first thing that happens is that the nucleosome is placed into the region, followed by de novo DNA methylation,” noted Dr. Jones. “The epigenetic variation between people is much higher than the genetic variation and thus may happen in many locations and carry larger effect-size on diseases than genetic variation,” said Asaf Hellman, Ph.D., group leader in developmental biology and cancer research at the Hebrew University of Jerusalem-Hadassah Medical School. Dr. Hellman talked about a novel approach that investigators in his lab, together with collaborators, used to unveil a new type of inter-individual DNA methylation variation that provides an independent source of human diversity. The involvement of genetic variants in type 2 diabetes mellitus has been known for several years. For the first time, Dr. Hellman and colleagues demonstrated that epigenetic factors shape the risk to develop this condition, a finding that has significant therapeutic implications for this and several other diseases. In their analysis, which included not only CpG sites from promoters, but also nonpromoter methylation sites, which were recently shown to also shape gene expression, Dr. Hellman and colleagues mapped DNA methylation variations, as opposed to only DNA sequence variation, and characterized a methylation signature that shapes the risk to develop type 2 diabetes. The stepwise approach involved, in the first stage, a microarray-based assay to examine DNA methylation levels in DNA pools obtained from individuals with diabetes and control participants. The identification and characterization of differentially methylated regions across the genome was followed by deep sequencing to examine the case-control association, and individual-level analyses subsequently helped explore the link between DNA methylation and disease. An important aspect, when describing epigenetic modifications associated with disease, is to differentiate primary epigenetic changes from changes that occur secondarily during disease progression. “Secondary events may be due to factors related to disease, such as genetic variation, which can be associated with altered methylation states, and we do know that many genetic sequences have some effects on the methylation of nearby sites,” continued Dr. Hellman. In a more detailed analysis of neighboring genetic and epigenetic polymorphisms within the first intron of the FTO gene, previously linked to type 2 diabetes, Dr. Hellman and colleagues demonstrated that methylation at this site is not secondary to genetic variations, but occurs through an independent mechanism. Therefore, it is indicative of an independent epigenetic mechanism that may provide a better prediction of disease risk, independently or synergistically with known risk factors. “Our study opens the way for evaluating the contribution of epigenetic polymorphism in predisposition for a long list of common human diseases,” said Dr. Hellman. Transcription factors of the Ikaros gene family are essential for cellular differentiation in the lymphoid branch of the hematopoietic system, and genetic defects in this gene family are implicated in hematologic malignancies. Esteban Ballestar, Ph.D., leader of the chromatin and disease group at the Bellvitge Biomedical Research Institute in Barcelona, and colleagues recently examined whether the Ikaros gene is also inactivated by aberrant methylation. “We found very little methylation in the promoters of these transcription factors in leukemias and lymphomas,” said Dr. Ballestar. However, the investigators made an unexpected observation. “We actually noticed aberrant hypermethylation in a different type of malignant tumor—colorectal cancer,” he continued. Dr. Ballestar and colleagues recently reported Ikaros promoter hypermethylation in all colorectal cancer cell lines and in over 60% of the primary colorectal cancers examined, and also found several deregulated Ikaros targets that might be important for colorectal cancer progression. “The possibilities offered by high-throughput enabled us to conduct screening to see whether methylation changes are focal or involve larger chromosomal regions. We saw that this hypermethylation occurred in context of hypermethylation within a larger region,” explained Dr. Ballestar. CpG hypermethylation occured in context of aberrant hypermethylation within a 2 megabase chromosomal region centered around the Ikaros gene, a phenomenon known as long-range epigenetic silencing, and this study provided the first piece of evidence establishing the functional importance of long-range epigenetic silencing in cancer, as it results in deregulation of Ikaros downstream targets. Furthermore, the authors found a correlation between the degree of Ikaros hypermethylation and tumor malignancy. The percentage of Ikaros methylation increased from approximately 30% in the less aggressive Dukes stage A tumors to 81% in the more malignant stage D tumors, a finding with important clinical implications. “It will not be too long until we can see antisense molecules directed against microRNAs being used in the clinic as anticancer therapeutics,” predicted Frank J. Slack, Ph.D., professor of molecular, cellular, and developmental biology at Yale University. MicroRNAs, a class of small RNA molecules that fulfill important functions during differentiation and disease, regulate gene expression at the post-transcriptional level and emerge as an exciting development in the field of epigenetics. Certain microRNAs function as oncogenes, while others are tumor-suppressor genes. One of the most interesting microRNAs, miR-21, is overexpressed in most tumor types analyzed to date, a finding that promises therapeutic applications. “The most important implication is the possibility of finding ways to target micro­RNAs such as miR-21 with antisense molecules or drugs, and this might become a very useful strategy in anticancer therapeutics,” pointed out Dr. Slack. Recently, Dr. Slack and colleagues generated a genetically engineered mouse that conditionally expresses miR-21. This animal model showed that miR-21 overexpression leads to a pre-B malignant lymphoid-like phenotype, and revealed its in vivo importance for all stages of tumor development including initiation, maintenance, and survival. “Oncogene addiction itself is one of the reasons why targeted drug therapies show at least some efficacy in patients at the moment, and we are currently testing whether microR-21 is also involved in other types of cancer besides lymphoma, and whether other microRNAs are also oncogenes and are also subject to oncogene addiction, just like miR-21,” according to Dr. Slack. The presence of metastases has important implications for cancer staging and treatment, and metastatic dissemination represents the leading cause of cancer mortality. Historically metastases have been associated with a dire prognosis. However, this paradigm was challenged in the mid 1990s, with a seminal observation made by Samuel Hellman, M.D., and Ralph R. Weichselbaum, M.D., from the University of Chicago School of Medicine, who introduced the concept of oligometastases. Oligometastases represent a potentially curable state during the evolution of some malignant tumors, intermediate between absent and widespread metastases. This was defined in the original study by the presence of five or fewer cumulative metastatic disseminations. “We set out to explore the biological basis that helps understand oligometastasis,” said Dr. Weichselbaum. In collaboration with Yves Lussier, M.D., at the University of Chicago, Dr. Weichselbaum’s group defined, by performing a bioinformatics analysis on differentially expressed microRNAs from histological cancer samples with oligo- and poly-metastatic dissemination, a prioritized list of several microRNAs associated with oligometastasis. “One of the highest ranking and most interesting candidates that we found is microRNA-200c,” said Dr. Weichselbaum. This microRNA, which suppresses ZEB1 and ZEB2, its direct targets that transcriptionally suppress E-cadherin, prevents the epithelial-to-mesenchymal transition and is important for maintaining epithelial cell identity. “We are working to try to validate this finding on a dataset of colon to liver cancer and on a variety of tumors metastasizing to the lung,” he continued. The involvement of microRNA-200c in oligometastasis is the first time that the biological basis for the differences between oligometastatic and polymetastatic states is explained and has important therapeutic implications. Recent years have opened an exciting time for epigenetics research, particularly with respect to development. “The epigenome is labile during periods of rapid cell division, and a change during that time is more likely to impact the organism. It may also be the ideal place for intervention,” pointed out Alicia K. Smith, Ph.D., assistant professor in psychiatry and behavioral sciences at Emory University. Dr. Smith and colleagues recently reported differences in neonatal CpG methylation that are specific to gestational age, and are present even in term deliveries. “It is known that DNA methylation patterns change as a person ages, but no study to date has shown such extensive differences over the weeks prior to delivery,” said Dr. Smith. The causal link between lower gestational age and the predisposition, over the course of the lifespan, to neuropsychiatric disorders and adult onset complex diseases has been known for several years, and these novel findings open the intriguing possibility that DNA methylation patterns may contribute to this association. “The central question is whether the different DNA methylation patterns that we see at different gestational ages are stable, and would predispose to detrimental health outcomes, or whether they continue to change as the individuals age,” explained Dr. Smith. 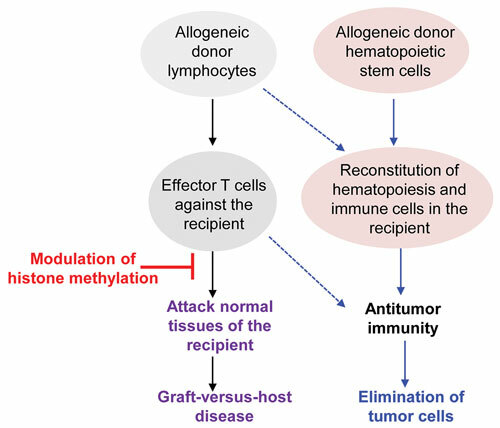 One of the severe complications following allogeneic hematopoietic stem cell transplantation, and a major limiting factor shaping their outcome, is graft-versus-host disease, which occurs when effector T cells from the donor tissue orchestrate an immune-mediated attack against recipient tissues. Graft-versus-host disease, an important cause of morbidity and mortality among transplant recipients, frequently represents a life threatening complication for which very limited therapeutic options are available at present. One of the relatively successful strategies is the use of steroids, but only about 40% of the patients respond and, overall, severe graft-versus-host disease is refractory and may be fatal in approximately 60% of the patients. Yi Zhang, M.D., Ph.D., assistant professor at the University of Michigan School of Medicine, and colleagues recently showed in a mouse model of graft-versus-host disease that administration of 3-deazaneplanocin, a histone methylation inhibitor, stopped the accumulation of alloreactive effector T cells after allogeneic bone marrow transplantation. The effect was associated with the selective activation of pro-apoptotic pathways in activated T cells, and was seen even after the disease had already been fully established. “It looks like the inhibition of histone methylation in activated T cells can immediately control the ongoing graft-versus-host disease, and this has never been achieved before,” said Dr. Zhang. While steroids weaken the ability of the donor T cells to launch an immune attack, and provide an effective therapeutic strategy for graft-versus-host disease, they also impair the other T cells. One key observation was that 3-deazaneplanocin did not inhibit the antileukemia activity of the donor T cells. “Our strategy, which modulates histone methylation but does not impair the immune cells undergoing homeostasis, allows to maximally protect naïve or standby immune cells from the inhibitor, and this is another beauty of our approach,” noted Dr. Zhang. Modulating histone methylation could provide a novel therapeutic approach not only for graft-versus-host disease, but for other medical conditions as well. “Given the profound effect of these inhibitors on the allogeneic T cell response, it could be possible to control other inflammatory disorders, such as graft rejection, which is an allogenic T cell response occurring in a different context, or autoimmune diseases, which most frequently have autoreactive T cells that are activated by self-antigens,” said Dr. Zhang. Allogeneic hematopoietic stem cell transplantation is a curative treatment for many hematological malignancies resistant to other therapies. This beneficial antitumor activity largely derives from the reconstitution of the normal donor hematopoiesis and immune cells in the diseased patient. Unfortunately, this antitumor immunity is tightly linked to a life-threatening graft-versus-host disease, confounding the efficacy of the procedure. A novel and clinically relevant strategy has been developed by targeting histone methylation, which controls the survival and expansion of effector T cells, to selectively control ongoing graft-versus-host disease while preserving the beneficial antitumor effects.